So I can crush Frieza with a steamroller? Sweet. 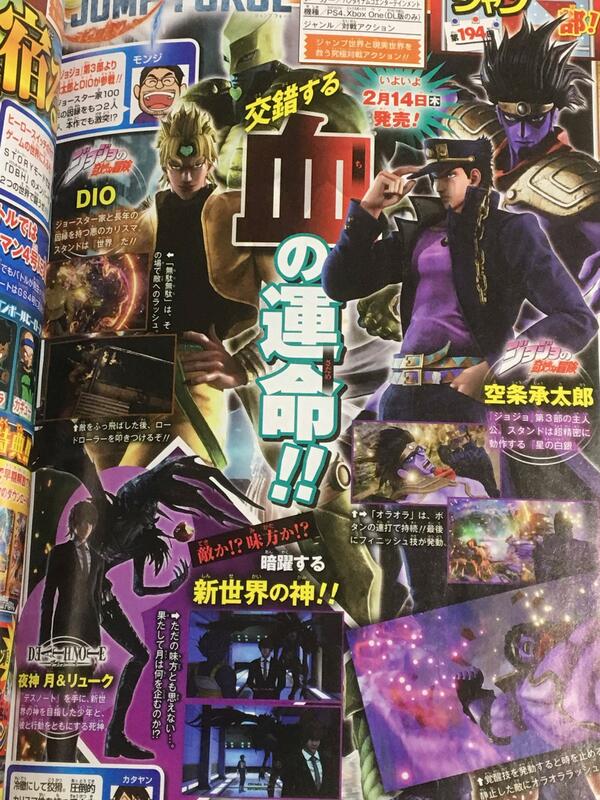 Yeah, a ton of Jotaro and DIO screenshots just came out. It looks like several of the stages will have a special nighttime skybox whenever DIO is in a match. The new stage (with the Black Whale) has also been potentially identified as Cathedral Cove, New Zealand. Pretty damn sure it isn't. Who said it was? It's not even coming out on the Switch. Not yet, anyway. In the trivia page for Jump Force under Dueling Games. From the main page on Dueling Works. I guess both were announced relatively close to each other, but they're completely different takes on fighting games and have completely different target audiences. Between that and the two months of difference in release, Jump Force is hardly competing with any other releases let alone Super Smash Bros. Ultimate. Just Deku and Aaaaaasta? Really? Okay. I'm surprised they didn't at least have more MHA characters besides Midoriya. Looks like Kaiba might be coming? That better be the case. Granted, I think we're actually at the point where no matter what the actual final roster is people are just gonna be piss off in general. Oh my god the cutscene/story animations are BAD . Worse than CG Berserk's at times. Game's nearly out and not a single professional review on metacritic. Pre-ordered the ultimate edition cause it looked like it was going to be a Xenoverse sucsessor and put in 2-3 hours last night. I honestly don't think I'll ever bother starting the game up again; no major gameplay issues it's just not fun to play. Minor issues I've noticed; bad animations (cutscenes, character movement in the hub world), model issues (female Ca C's have to have some major back problems), and my biggest gripe the absence of distributable stats. Leveling up boosts your stats in general but you have no control over distribution to customize the character to your playsyle. No critical reviews, hilarious graphics, and racist Deku. Not a good look. but Bandai Namco sent out a lot of early copies out to various popular youtubers. They know the game is trash but they're banking on people on youtube who are only going to sing its praises to sell it.